Mark Bryan and Garry Eister's "The Screaming Bunny" Performance 3/17 at Carlotta's Passion Fine Art A Benefit for "The World Can't Wait - Drive Out The Bush Regime"
A Benefit for "The World Can't Wait - Drive Out The Bush Regime"
Date: Saturday, March 17th at 8:00 p.m. - 9:00 p.m.
Mark's exhibit runs until April 1, 2007. Note: Please RSVP via email to rs@carlottaspassion.com so that we can meet the requirements of our audience for this event. Artist Mark Bryan and composer Garry Eister will present “The Screaming Bunny”, a collaborative installation/performance. The Screaming Bunny is a large stuffed rabbit whose face has been replaced with three television monitors, two depicting eyes and one showing his mouth. The bunny is strapped into a "screaming-bunny-restraining-chair." In part one of The Screaming Bunny Songs, an actor portrays a research scientist who has brought the bunny home as a part of an animal research experiment. The actor and the bunny never interact. Instead, we hear the text of a letter that the scientist writes, explaining the experiment and its unexpected cruel metamorphosis to a friend. At the end of the piece, the bunny sings a poignant song about his connectedness to the Earth. Parts two and three examine the bunny's life in the lab. The plot thickens! Mark's artwork has appeared frequently in AdBusters and Juxtapoz. Bryan says, "'Ever since I can remember, I've been troubled by the state of things. Maybe it was all that talk about heaven in Sunday school. A perfect world, why isn't it like that here? I feel ripped off. Even the animals didn't eat each other in heaven. Imagine that." "Given this beautiful planet, our intelligence, talent and opposable thumbs, one would think that things for us would be a lot better than they are. I suppose I've carried a general disappointment in human nature for quite a while that makes itself apparent in most of my work. It seems to me that in terms of what we do to each other and to our environment, we really are fiddling while Rome burns. Perhaps we are either too smart or too dumb for our own good. As a result of this perspective, satirical work is the logical direction for me. Humor allows for comment to be made without alienating the viewer. I believe it also shows a larger view and some affection and sympathy for the players in it." "In my paintings I see the world as a cosmic stage for human activity. I'm in the audience like a court reporter taking notes with my sketchbook and brushes, playing the critic, here to observe and make comment. I usually begin a painting with a beautiful natural landscape, but can't seem to leave it at that. Because of my need to make comment, I feel compelled to fill it up with depictions of absurd human activities and/or violent acts of revenge by Mother Nature. 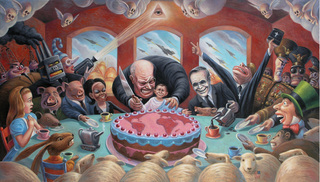 These depictions are full of symbolism, exaggeration and parody, much in the manner of political cartoons. I like to show men involved in their own tiny dramas while oblivious to greater and more powerful forces around them." attempted to retain in the work the fun that can come from satire and parody and at the same time deal with these serious subjects. Not all my work is satirical and colored with a cynical perspective. When I've had enough of social comment for a while, I change direction and create work that is just for fun or try to explore more positive aspects of our existence. Apart from all the trouble we cause ourselves, I believe we are immersed in a powerful and beautiful mystery. The fact of our existence is a great riddle to me. Gauguin in his famous painting asks 'Whence do we Come? What are We? Whither are we going?' For me, those questions are always worth trying to answer." Garry Eister studied with Edward Applebaum, Peter Fricker, Emma Lou Diemer and considers Daniel Lentz to be his mentor. During their association in Santa Barbara in the 1970's, he performed with Lentz's groups on the West Coast and on four European tours. Eister has a Ph.D. in music composition from UCSB and lives in Arroyo Grande, California. He works as an artist-in-residence in Santa Barbara County schools, teaching folk songs and musical games to elementary school children. - Kennedy Center and Wigmore Hall (London) In 2005, guitarist Lily Afshar performed his "Fantasia On a Traditional Persian Song" at the Kennedy Center in Washington, D.C. and at Wigmore Hall in London. The piece is included on her Archer Records CD, "Hemispheres." - Carnegie Hall - In April of '01, the Kreitzer/Davies/Nagano Trio performed his monodrama, "Like Writing on Water," at the Weil Recital Hall at Carnegie Hall in New York. - Sony Classical - His "Quintet for Glass and Strings" was recorded by Dennis James and the Emerson String Quartet for "Cristal: Glass Music Through the Ages," an album of music for instruments made of glass, produced by Linda Ronstadt and John Boylan for Sony Classical. Bob Squires, Owner/Director, Carlotta's Passion Fine Art, 2012 Colorado Blvd., Los Angeles, CA 90041; Tel: 323.259.1563. Hours: Wednesday - Sunday, 12:00 - 9:00 p.m.
Artists Represented: Patssi Valdez, Gilbert "Magu" Lujan, Frank Romero, Martin Charlot, Diane Gamboa, Margaret Garcia, Irene Carranza, Leo Limon, Alfredo de Batuc, David Flury, Tony de Carlo, Hector Silva, Sergio Hernandez, James Osorio, J. Dudley Slay III, and Paul Ygartua.